We are going to start by creating the fabric. 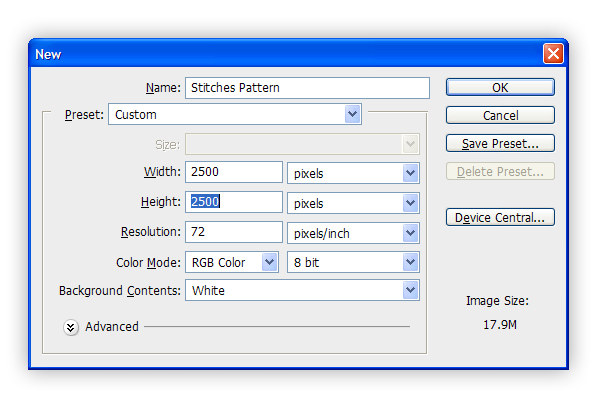 Create a New Document at any size (I’ve created a 250 px by 250 px canvas). 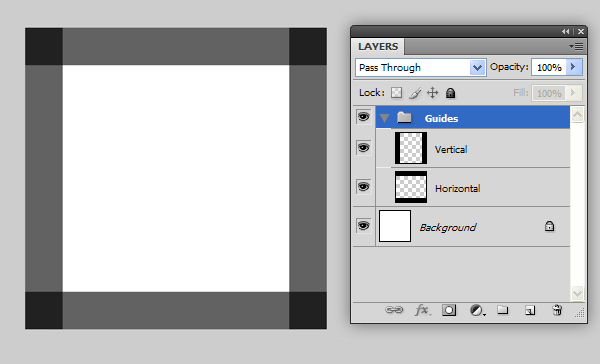 Using the Rectangle Tool, make a small black rectangle on a new layer. 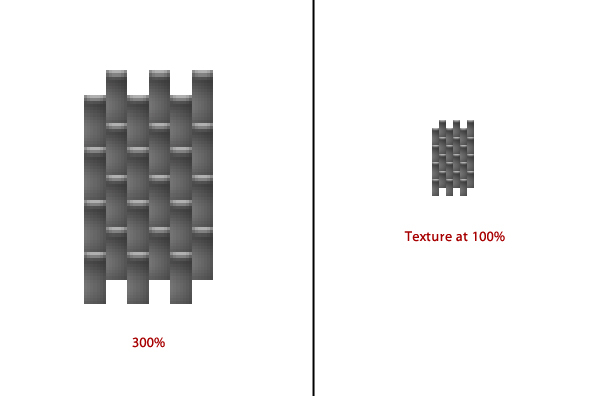 The result is the building block of our texture. Make multiple instances of this shape and position as shown. 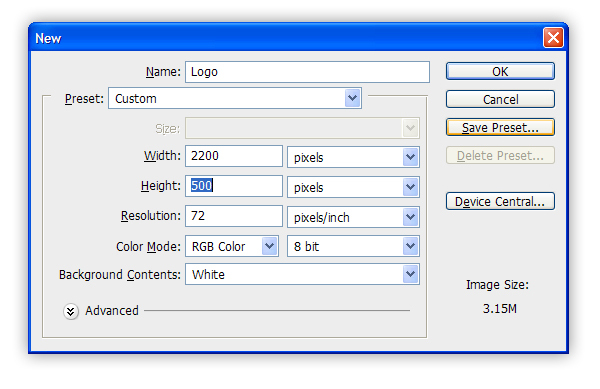 Flatten the image and use the Rectangular Marquee Tool to make a selection. Notice that I have made a selection that will result in a seamless pattern. Once you are comfortable with the selection you have made, go to Edit > Define Pattern. Name the Pattern and click OK.
Now that we have a pattern, we will use it to create a larger swatch of fabric that we will add to our final scene. Create a New Document 2500 px by 2500 px. Go to Edit > Fill. 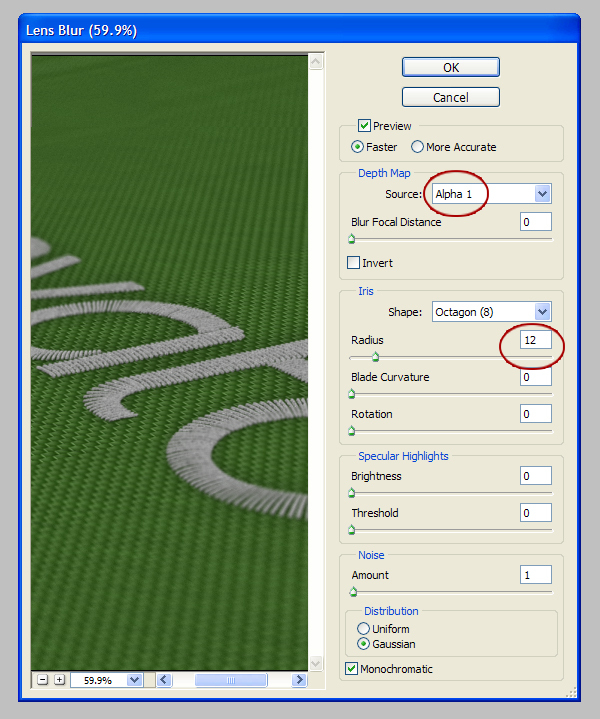 Select Pattern from the drop down and choose the new Custom Pattern we just created (it should be at the bottom of the list). I want to add a little bit of variation to my pattern. Start by creating a new layer filled with white. 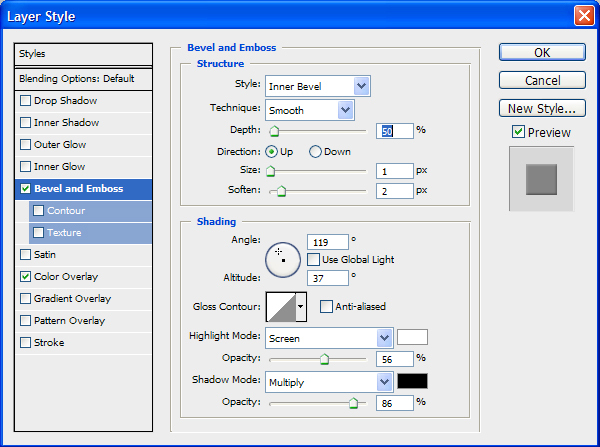 Add Noise set to 100% and give it a Motion Blur with a setting of 40 px at a 55 degree angle. 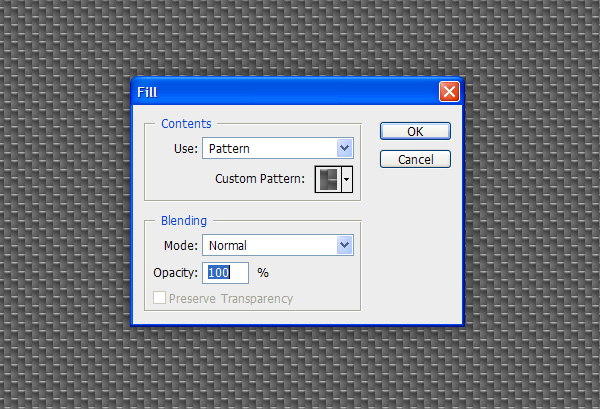 Set the Blending Mode to Multiply and the Opacity to 75%. 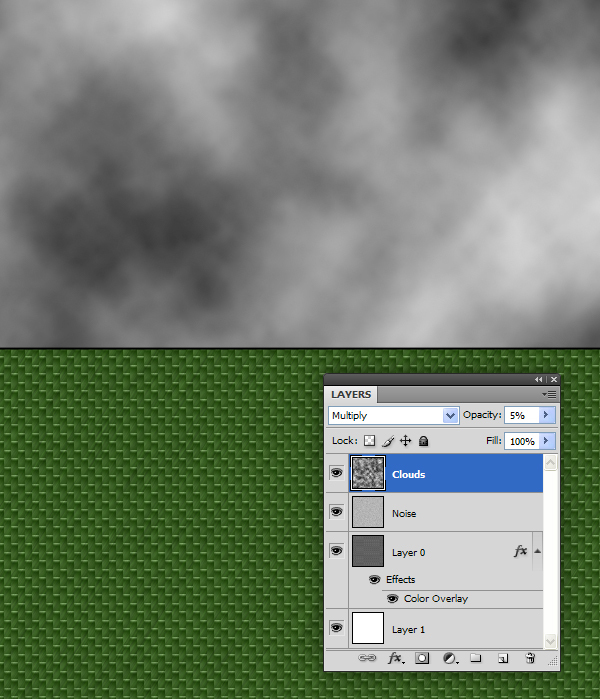 To continue adding some variations to our texture, create another layer and Render Clouds (Filter > Render Clouds). 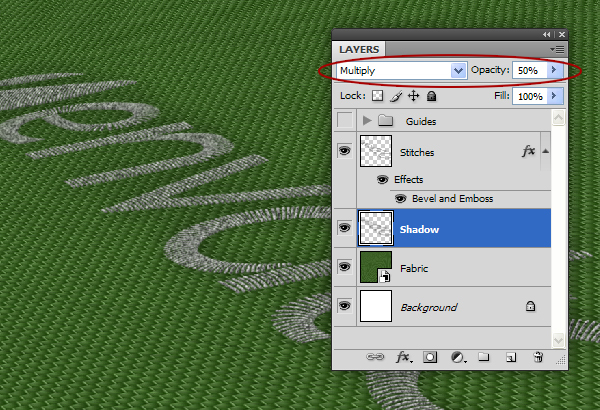 Set the Blending Mode and Opacity as shown. 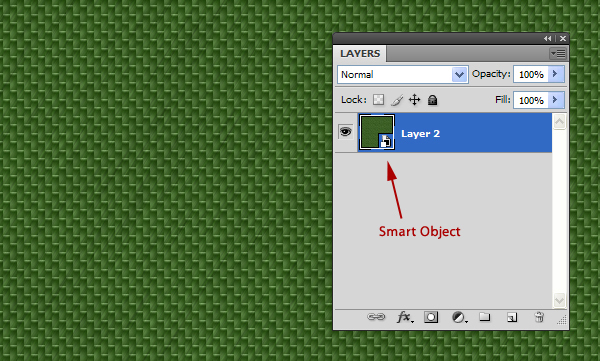 Select all layers in the Layer Panel and Right-Click and select Convert to Smart Object. Rename the Smart Object to “Fabric” and save this file. We need to create a new document for our iPad Wallpaper. The resolution of the iPad is 1024 px by 768 px, which means that when rotated horizontally or vertically, it will be at most 1024 wide or 1024 tall. 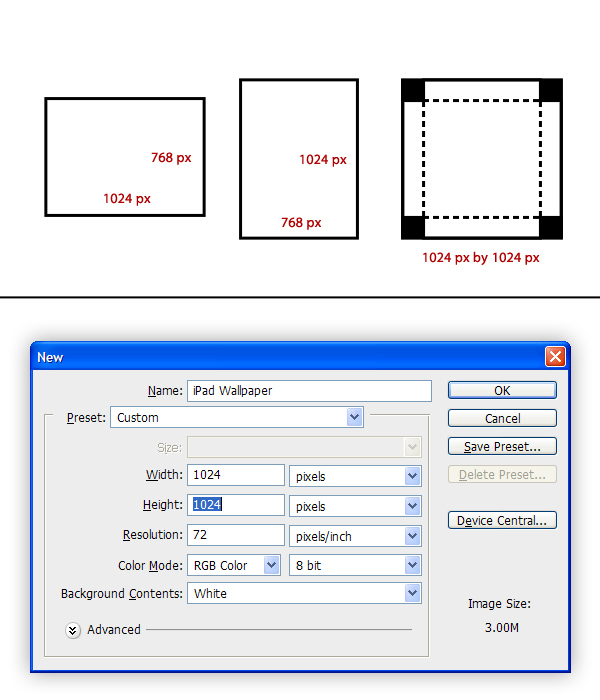 To make sure that our wallpaper will fit the screen at any orientation, we need to create a new document 1024 px by 1024 px. To help me visually, I have created a new group that contains guides for both the horizontal and vertical orientations of the iPad. For now, we can hide the guides. 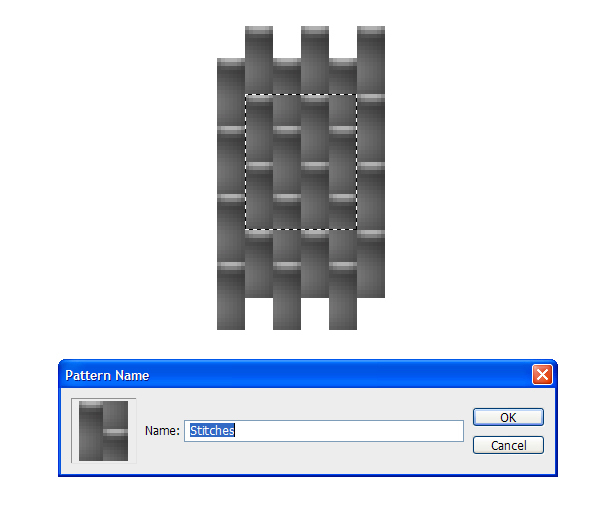 Import Smart Object of the fabric pattern into this scene. 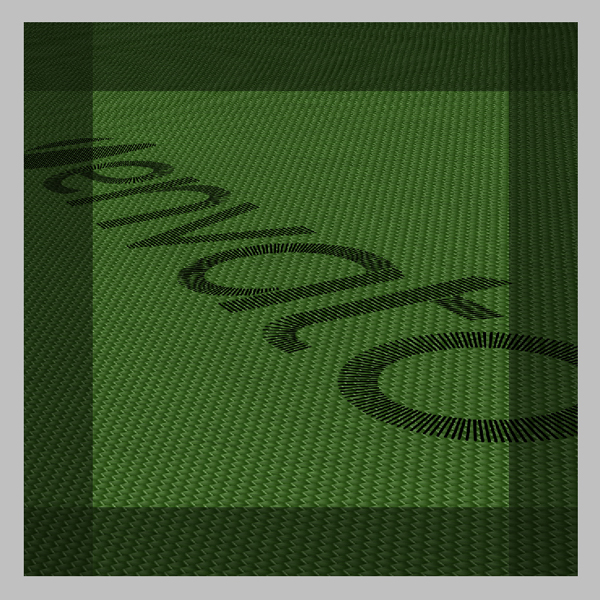 Transform (Command/Ctrl + T) this texture to a desirable perspective. Save your document. We need to create the stitches in a separate document. We also need to make sure the document is large enough so that there will be little distortion when we place this into perspective. 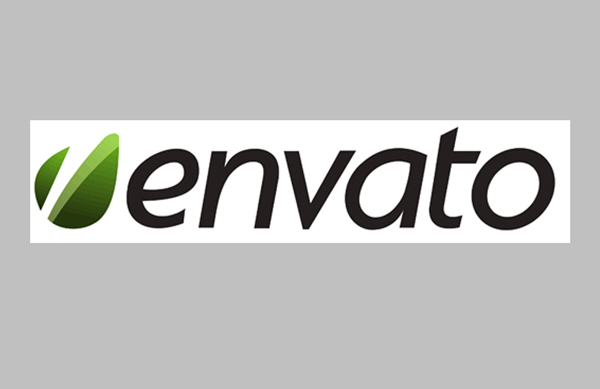 The overall size of your document will depend on your text or logo. For this project I have created a new document 2200 px by 500 px. 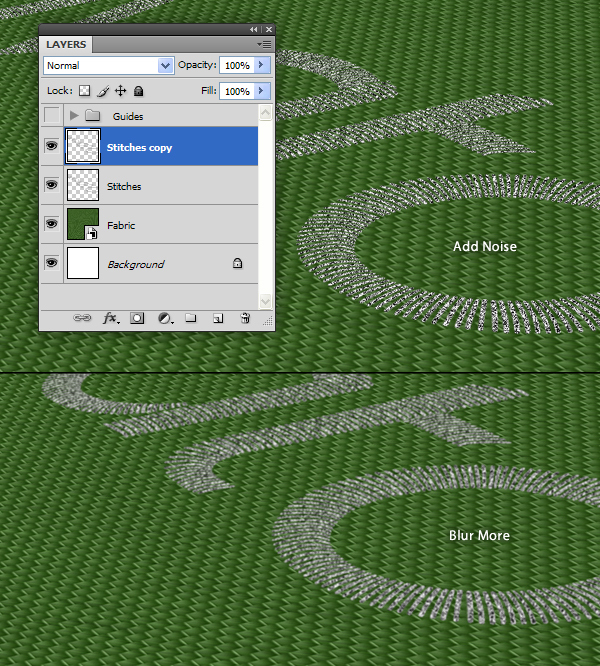 Find a logo or some text that you like and paste it into your scene. Scale it (Command/Ctrl + T) to fill the space. We will now create the individual stitches. 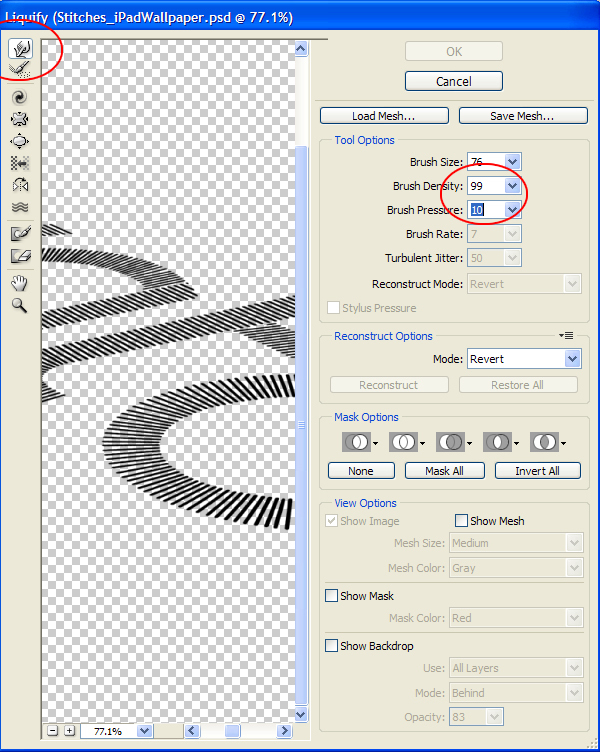 If you are familiar with Illustrator, it may be easier to create them there (especially with the Blend Tool), but since this is a Photoshop Tutorial, I will create them in here. 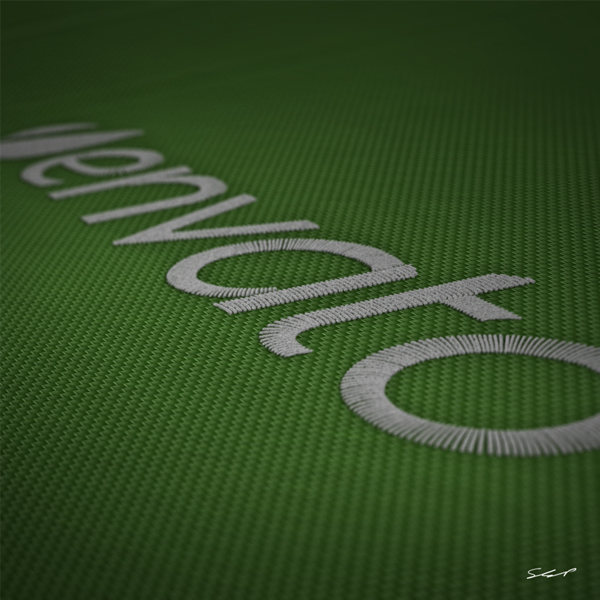 As you can see, I’ve changed the Opacity of the Logo layer so that it will be easier to see my work. 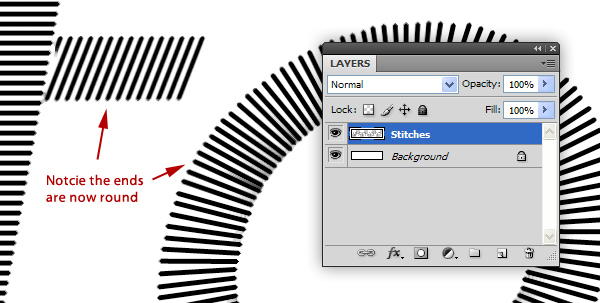 On a new layer, use the Line Tool to draw stitches over your graphic as shown. 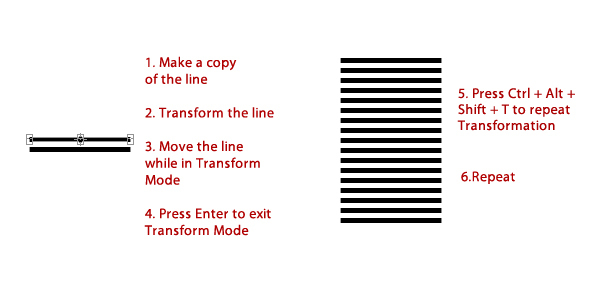 To cut down on your work, draw one line and make a copy of it (Command/Ctrl +J). Press Command/Ctrl + T to enter the Transform mode. Move the line up slightly and press enter to set the changes. Now press Command/Ctrl + Alt + Shift + T to repeat the transformation. Keep pressing this shortcut until you have a line of stitches. This process will result in multiple layers. 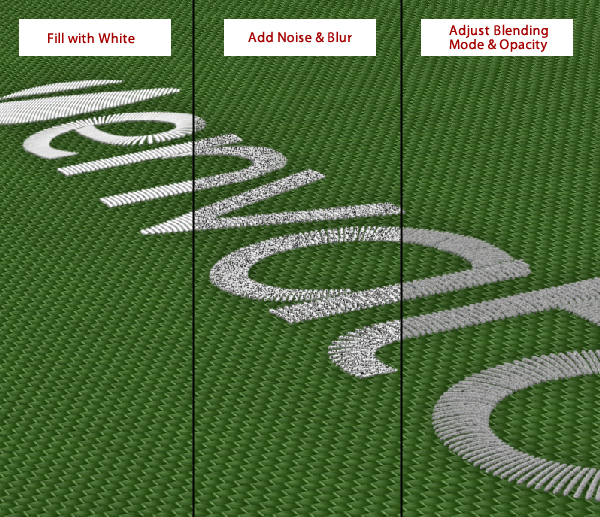 Make sure to merge these together then use these stitches to fill in the appropriate areas of your logo. 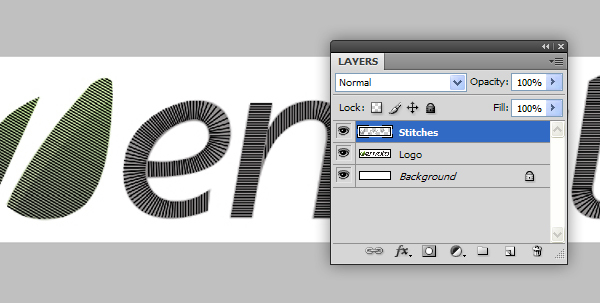 Continue to draw in stitches for round areas of your logo. 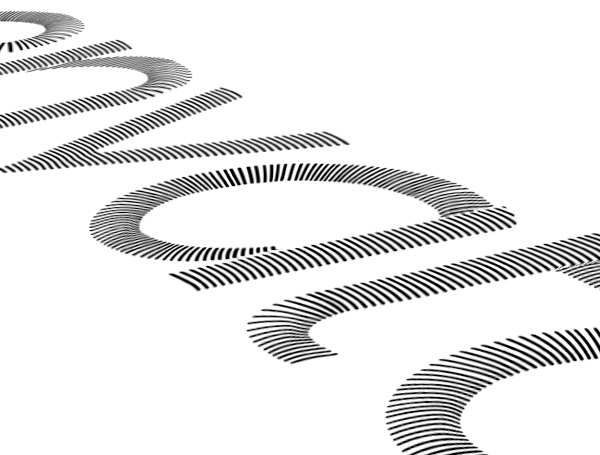 Now that we have a logo converted to lines, we need to make the ends of each line round. 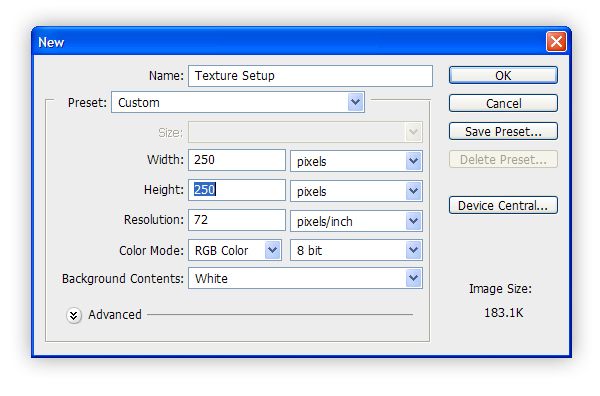 Add the Median Filter (Filter > Noise > Median) with a setting of 1 px. You may notice that the filter caused some stitches to blend together. 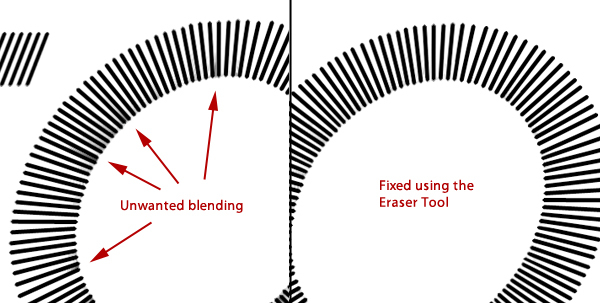 Just use the eraser tool to clean up these areas. Now that the stitches are done, we can finish building our wallpaper. Load the stitches into our iPad Wallpaper scene and Transform (Command/Ctrl + T) into perspective on top of the fabric background. Make sure to turn on the guides to check how the positioning will look in both the horizontal and vertical orientations. We need to add the appearance of stitches raised above the surface. 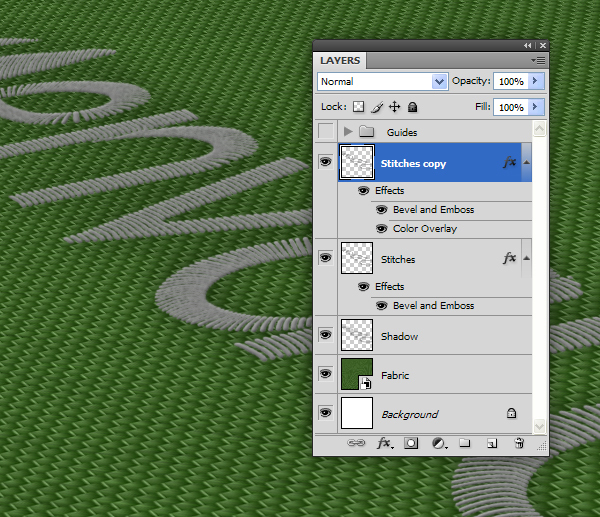 To do this, we will use the Liquify Filter to add a slight bend to the stitching. Go to Filter > Liquify and, with the Forward Warp Tool selected, set the Brush Density to 99 and the Brush Pressure to 10. Start with a Brush Size of 76 and start to push the stitches so that they appear raised. Work your way through all the stitches, changing the Brush Size as necessary. 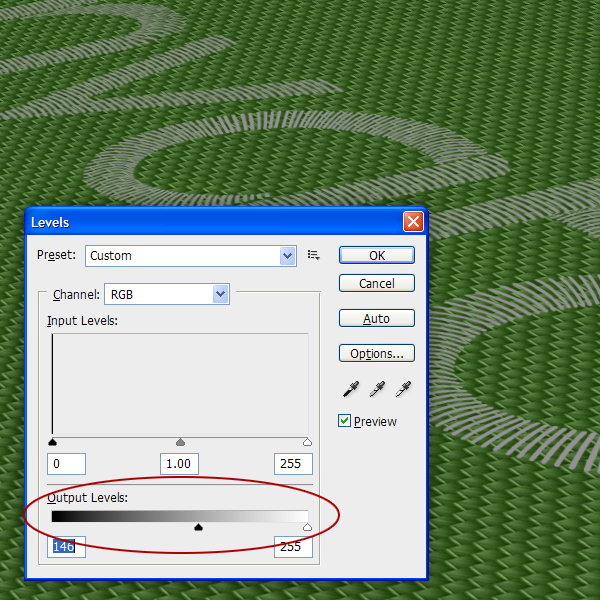 Since we want the stitches to be white, go ahead and adjust the Levels (Command/Ctrl + L) using the bottom sliders. 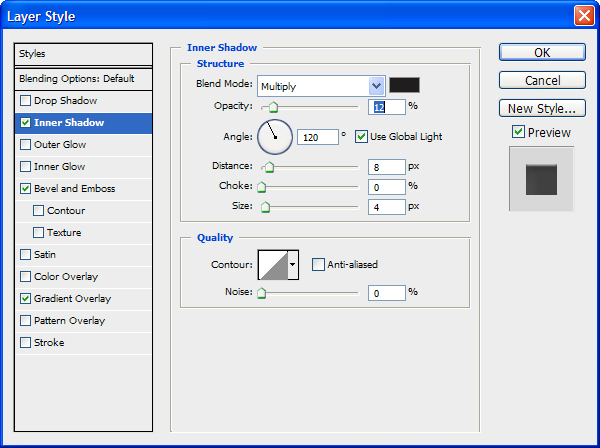 Make a copy of this layer and add the Noise Filter with an amount of 100%. Next, go to Filter > Blur > Blur More to soften the noise. This will give us that rough texture of a course stitch. 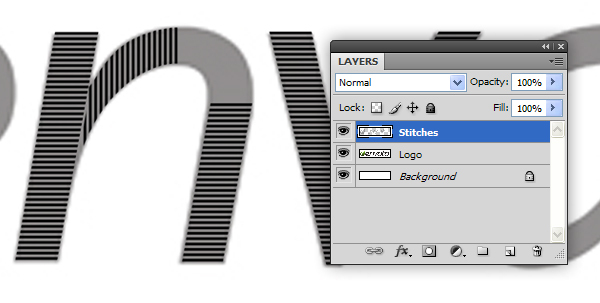 Make a copy of the “Stitches” layer and rename it to “Shadow.” Remove the Layer Style and adjust the Levels (Command/Ctrl + L) until it is pure black. 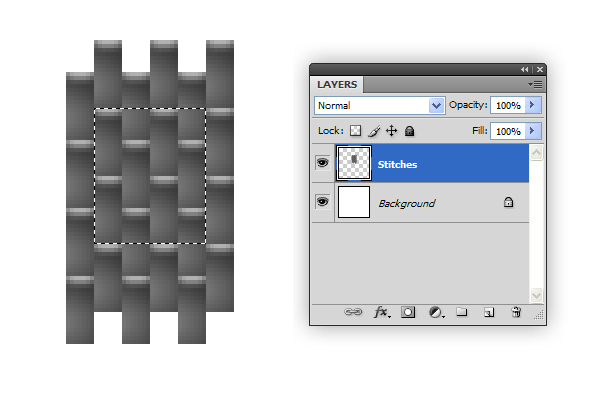 Position this new layer under the “Stitches” layer. 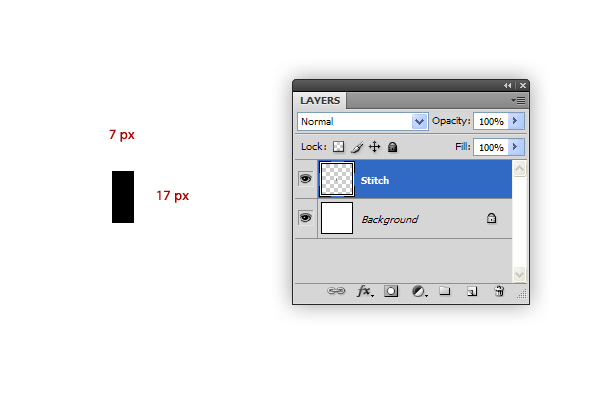 Give this layer a Gaussian Blur of 14 px and set the Blending Mode to Multiply and the Opacity to 50%. 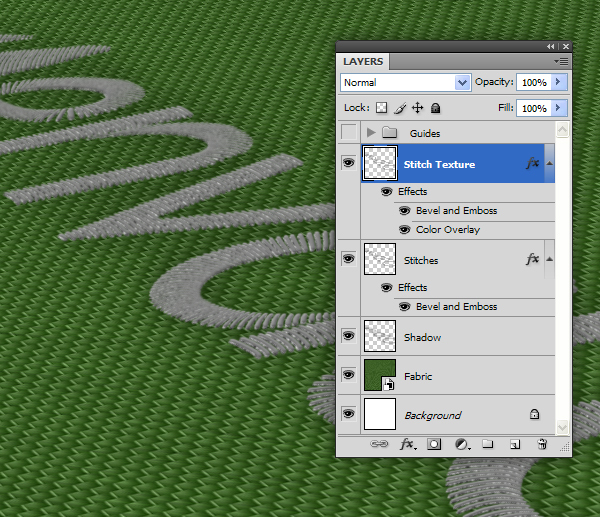 Rename this layer to “Stitch Texture” and use your arrow keys to nudge this layer up and to the right. 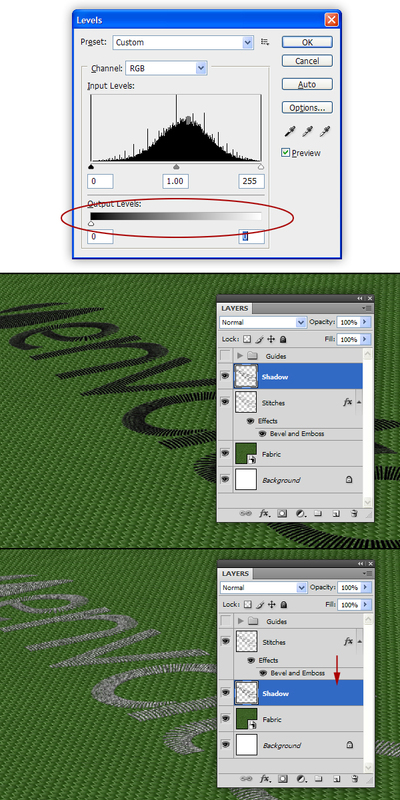 With the “Stitch Texture” layer selected, Command/Ctrl-Click the layer’s thumbnail to select its contents. On a new layer, fill the selection with white. 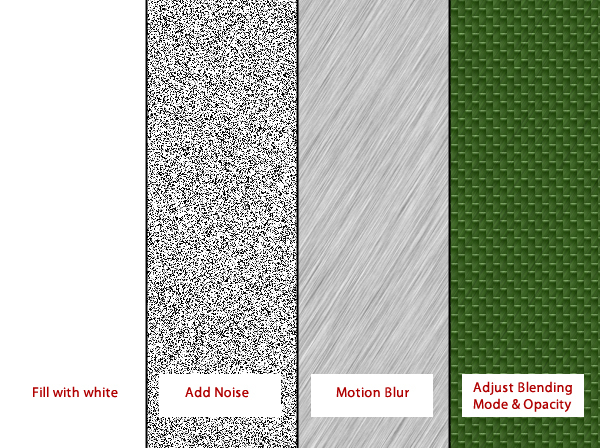 Add Noise with an Amount of 87% and go to Filter > Blur > Blur. 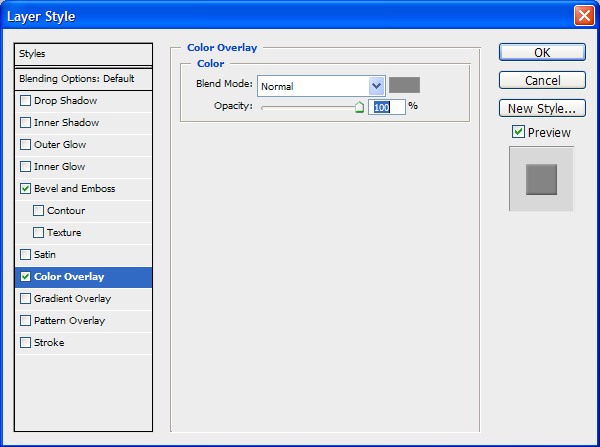 Finally set the Blending Mode to Screen and the Opacity to 35%. To finish the stitches, make a copy the “Stitches” layer. Remove the Layer Styles and adjust the Levels (Command/Ctrl + L) until it is pure black—just like we did in Step 29. 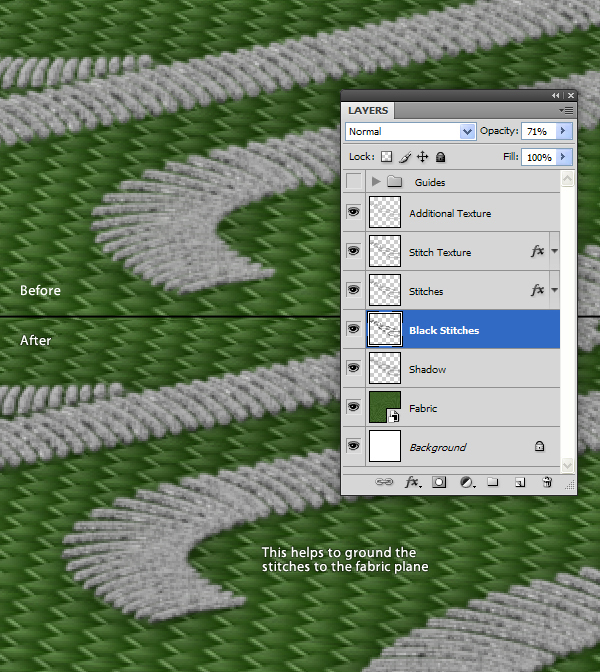 Move this layer below the “Stitches” layer and apply a Gaussian Blur with a setting of 1.8 px. 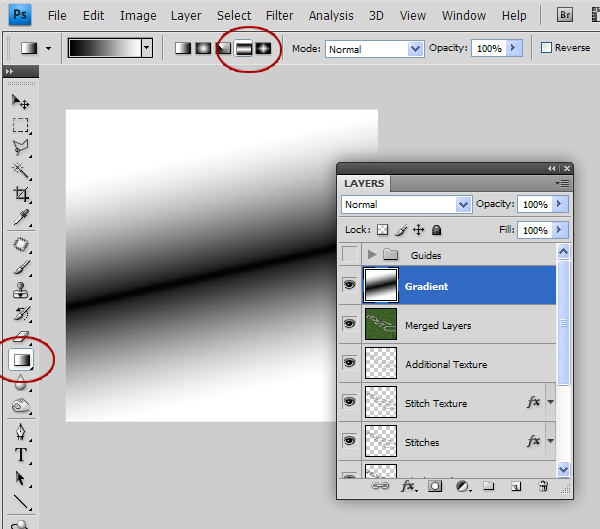 Lastly, set the Opacity to 71% and nudge the layer down a bit so that it becomes more visible. 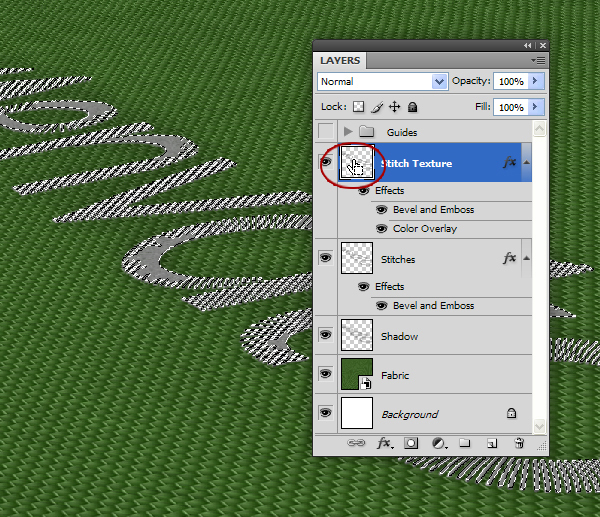 This is a subtle effect that will help ground the stitches to the fabric. 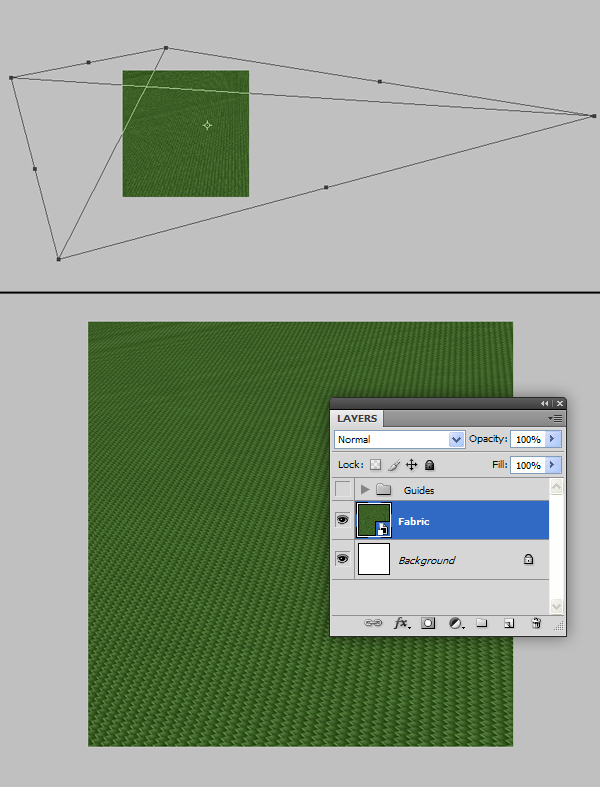 The last thing we need to do is apply a depth-of-field effect to the image. 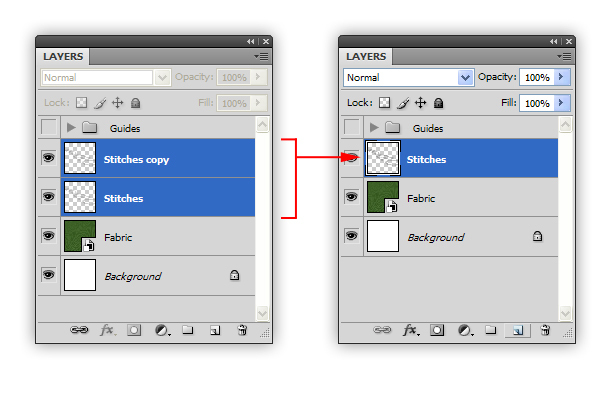 Start be merging a copy of the layers (Shift + Command/Ctrl + Alt + E). 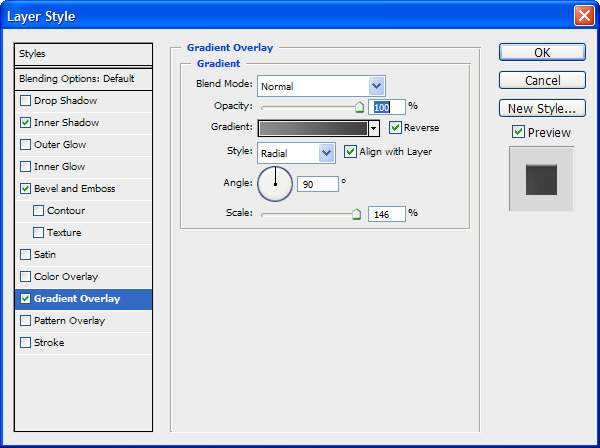 On a new layer, use the Gradient Tool with the Reflected Gradient option selected to make the following gradient. 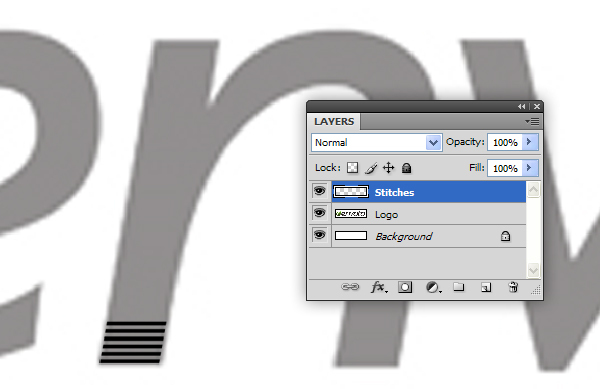 Select All (Command/Ctrl + A) and Copy (Command/Ctrl +C) this layer and go to the Channels Panel. 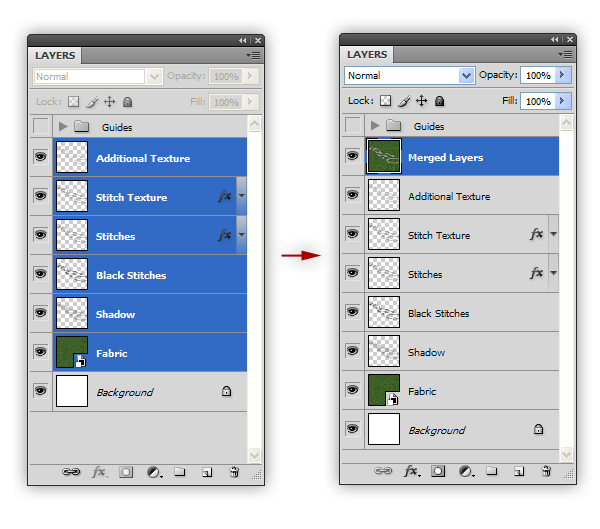 Create a new layer in the Channels Panel and Paste (Command/Ctrl + V) the selection. 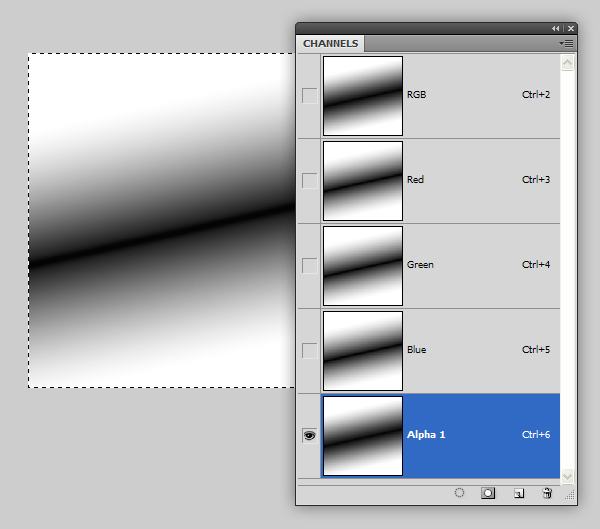 We will use this newly created alpha channel when we add the Lens Blur. برای ادیت کردن فیال wp-config میبایست آن را در Notepad باز کنید تا به راحتی ویرایش شود… ممنون…. با تشکر از نوشته مفیدتان، در مورد بهینه سازی برای جستجوی تصاویر – image search – در صورت امکان مطلب بگذارید. همچنین در مورد تغییرات اخیر الگوریتم گوگل و دلیل از دست دادن رتبه برخی سایتهای ایرانی – از رنک ۴ و ۵ به ۰ !!! – د ر صورت امکان مطلب بگذارید.